To identify, catalog and evaluate the health of the trees and foundation plantings at McCorkle Place. Develop thoughtful recommendations for future tree and building plantings. Identified the trees and shrubs and assigned “low”, “moderate”, and “high” ratings based on how a healthy specimen of each taxon should appear. “Moderate”- to “high”-rated plants are in good-to excellent-condition and require “normal” maintenance. The “low”-rated would ideally be removed and new plantings constituted. Table 1 is the composite; Table 2 presents plants by location. Over 680 taxa were cataloged. The number reflects the building foundation shrubs and small trees. However, the essence of McCorkle resides in the splendid diversity of noble trees anchored by the Quercus alba, white oak, with 88% (22/25) rated “high” and three “moderate”. These white oaks may parallel in age those on Polk Place. The exciting aspect is the exceedingly vibrant health of these trees. Canopies were full and dense, foliage saturated blue-green, leaves plump and oversized, bark and trunks without wounds and abrasions. At least 15 Quercus taxa were identified at McCorkle. In fact, the genus constitutes 54% of the total trees. The three Quercus michauxii (could be Q. montana), swamp chestnut oak, are magnificent. A terrific specimen also resides in the Coker Arboretum. This, Q. montana, and Q. muehlenbergii should be planted in greater numbers. Newly planted, healthy, Q. shumardii (Q. nuttallii) were noted toward the Franklin Street portion of McCorkle. Both are excellent species and more available in commerce. A great surprise was the presence of Ilex opaca, American holly, serendipitously scattered throughout McCorkle. Eleven of the 13 (85%) specimens rated “high”; two “moderate”. Ilex opaca tolerates, actually thrives, in shade, as do many hollies. Abundant fruits among the healthy, dark olive-green leaves equated with excellent health. Additional American hollies should be added for their aesthetics and also functionality as screens and groupings. Over 1,000 cultivars are reported so the options are abundant. Twenty-eight species (Table 1) are cataloged in the Quadrangle area. A single Carya specimen was assessed. Carya was one of the healthiest and most common genera in Kenan Woods. The Prunus, cherries, including piddley weeping (‘Snow Fountains’), a few larger weeping (P. subhirtella ‘Pendula’), several train wrecks (P. serrulata ‘Kwanzan’/‘Kanzan’, et al. ), did not mesh with the tenor of McCorkle. If cherries are integral, then larger, tree types like, P. avium, P. subhirtella, P. ×yedoensis and P. sargentii are recommended. Newer P. sargentii types, ‘First Lady’ and ‘Pink Flair’, are improvements. An option includes planting noble trees (see list below) in proximity to the cherries, eventually removing the latter. Cherries are not particularly shade tolerant; thus growth and flowering acumen decrease with competition. The azaleas in the Old Well area range from healthy to dead. The irrigation system was not providing even coverage, and large areas in both mass plantings were declining/dead. A restoration of the planting beds, soil improvements, drainage, irrigation, newer cultivars like Robin Hills, Encores, are possibilities. Another possibility is the elimination of the azaleas, adding a low, tasteful hedge at the periphery and planting tree(s) in the newly developed interior spaces. Ilex vomitoria ‘Schillings’ hedges with seasonal color plantings within, is yet another approach. The Acer mono (Acer truncatum subsp. mono) is among the rarest trees encountered in all the assessments. The tree is in the latter stages of arboricultural bliss. Recommend researching the history of this specimen and also planning a young version to assume the master’s/mistress’ rightful place. Overall, the main Quadrangle from Cameron to Franklin is in excellent condition. Fifty-nine percent of the trees rated “high”, only 20.5% “low”, and most were concentrated in Fraxinus species and Ulmus species. Recommend new future tree plantings, possibly 5 to 10 per year for five years. Each year assess those in the worse condition and replant the same or related species in proximity. There are many Prunus serrulata taxa, as well as other cherries, that are creaky and cannot be rejuvenated. Eight of 11 (73%) serrulata types were rated “low”. Opportunities exist to rethink the current cherry plantings as previously described. McCorkle should never be cluttered with small-stature trees. The great boles of the noble trees, the canopies providing cooling shade, architectural winter silhouettes, subtle to riotous fall colors, early fresh green from the Liriodendron to the mouse-ear-gray and -pink of the Quercus alba…Heavensent. McCorkle only needs tweaking. Table 2 lists shrub and tree plantings by location. Specifics relative to identification, condition, quantity and notes are included. Plants were documented at Old East/Alumni Parking, Alumni Building and Graham Memorial. The Alumni Building landscape appeared to be a recent installation (2 – 3 years) with a mix of about 16 different trees and shrubs. The Ilex, hollies, were in “moderate” to “high” condition. The use of variegated gardenia Gardenia augusta ‘Radicans Variegata’, which had reverted to the green-leaf type, should be curtailed. Numerous, compact, cold hardy gardenias like ‘Daisy’, ‘Daruma’, ‘White Gem’, ‘Kleim’s Hardy’ and ‘Heaven Scent’ are superior. Counted 35 ‘Radicans Variegata’ with almost every one reverting. Forty-five Berberis thunbergii var. atropurpurea ‘Crimson Pygmy’ were noted. Ideally shift away from Berberis taxa since they are considered invasive. Utilize the new red-purple loropetalums for foliage effect. ‘Purple Pixie’ and ‘Purple Diamond’ are two of the recent, lower-growing introductions. Danae racemosa, Alexandrian laurel, on the east side of Alumni was a pleasant surprise. The species (40 counted) requires shade and hopefully will establish as the other shrubs grow. Opportunity to add evergreen viburnums like ‘Conoy’, ‘Eskimo’, and V. tinus. As suggested in the Polk Place report, the increased use of low- to mid-size evergreen (and deciduous) shrubs instead of extensive mulching would result in more aesthetic plantings. Graham Memorial requires attention (new plantings) on the Franklin Street side. Generally most shrubs rated “moderate” to “high”. Ilex and Prunus laurocerasus cultivars comprised 59% of the total plants cataloged under Graham Memorial (see Table 2). Four different P. laurocerasus cultivars were utilized around Graham, often cheek-to-jowl, contrasting because of habit and foliage characteristics. Pleased to note Fothergilla ‘Mt. Airy’ utilized in Old East and Graham. For aesthetic and maintenance reasons, greater utilization of large groupings and masses is encouraged. Again, the rationale with suggested alternative plants was discussed in the Polk Place report. Herbaceous perennials (a few evergreen, like Helleborus taxa) were recorded and are included with the Addendum: McCorkle Place–Existing Groundcover Plants and Notes (June 18, 2008). The over-riding question concerns the necessary care to clean up, prune, water, and mulch many of the herbaceous perennials. Certainly, at their best, great for texture and seasonal color, but can they be properly maintained? Old East/Alumni Parking Tree Prunus ×yedoensis ‘Snow Fountains’ High 2 Why here? 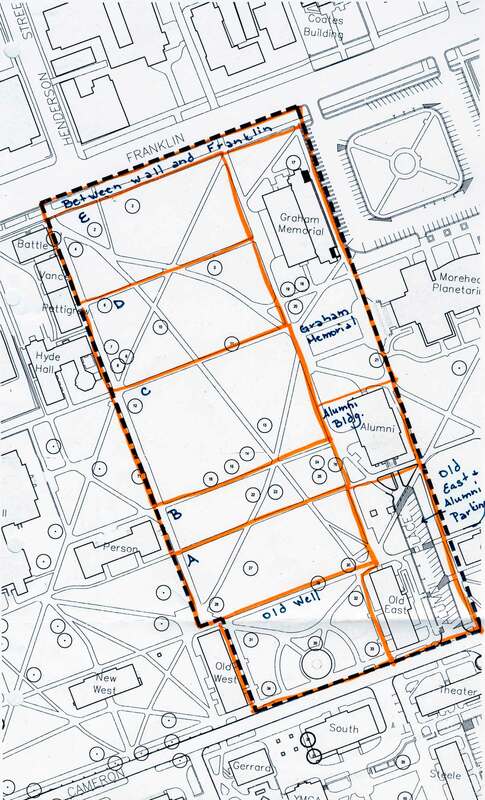 McCorkle Place A – E These are the 5 areas of McCorkle Place gridded by paths that run East to West running North from the Old Well and Old East/Old West Buildings. Graham Memorial Shrub Hypericum calycinum Low mass Typically short-lived.